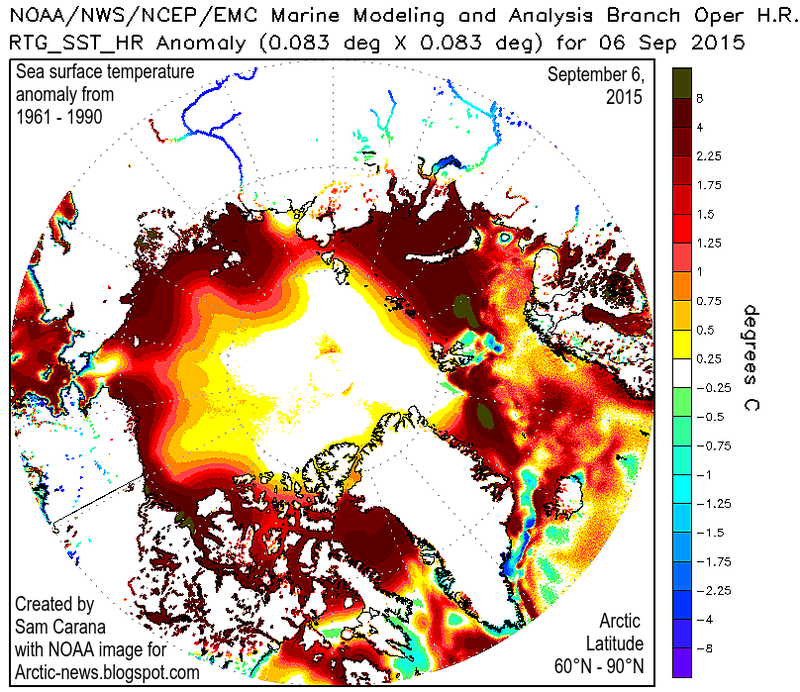 The image below, from Arctic-roos.org, shows Arctic sea ice extent up to September 6, 2015. 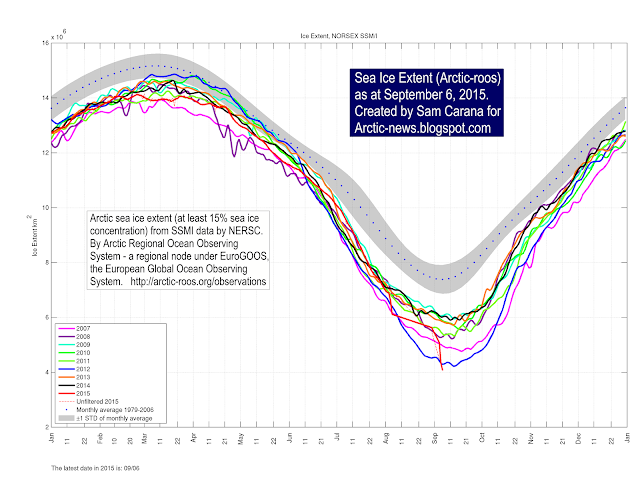 The image shows a recent drop in sea ice extent that is so dramatic (red line, i.e. extent for the year 2015) that some think that it must be a glitch in the system. Even so, it should act as a warning about deterioration of the sea ice in the Arctic. As discussed in earlier posts, the sea ice today is in a terrible condition. Thick sea ice is virtually absent compared to the situation in the year 2012 around this time of year, as illustrated by the image below that compares sea ice thickness on September 5, 2012 (left panel) with September 5, 2015 (right panel). Furthermore, sea surface temperatures are very high. The North Pacific, on September 3, 2015, was more than 1°C (1.8°F) warmer than it was compared to the period from 1971 to 2000, as illustrated by the Climate Reanalyzer image on the right. Sea surface temperature are very high around North America, both in the Pacific Ocean and in the Atlantic Ocean. 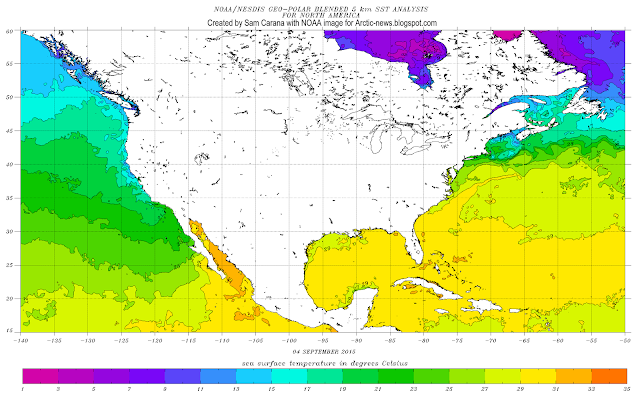 The image below shows sea surface temperatures on September 4, 2015, indicating that a huge amount of ocean heat has accumulated in the Atlantic Ocean off the coast of North America. The Gulf Stream is pushing much of this warm water toward the Arctic Ocean. Additionally, warm water from the Pacific Ocean is entering the Arctic Ocean through the Bering Strait. 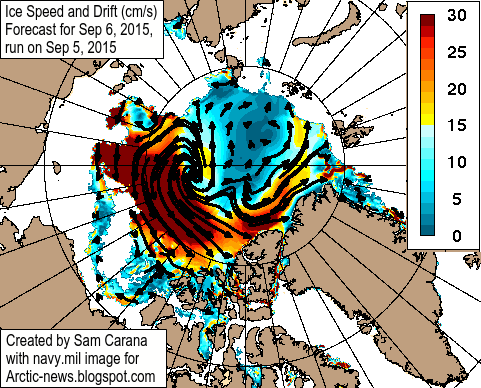 Above image below shows sea surface temperature anomalies in the Arctic as at September 6, 2015. 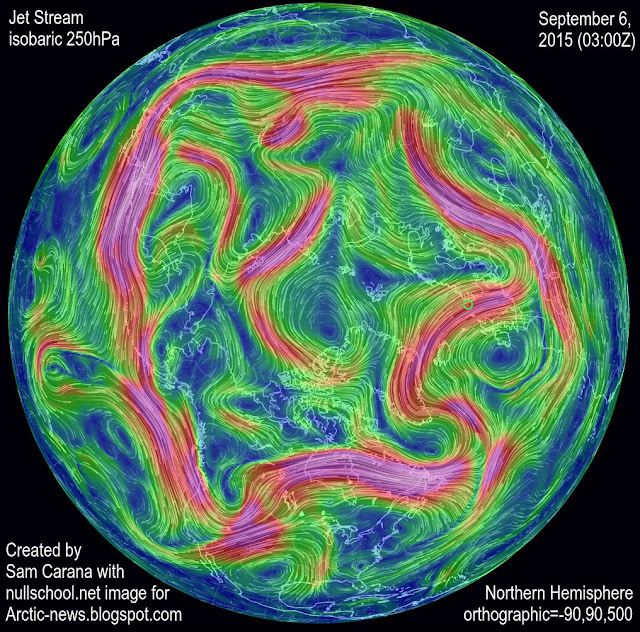 As the Arctic warms up faster than the rest of the world, the jet stream becomes ever more destabilized, as illustrated by the image below. 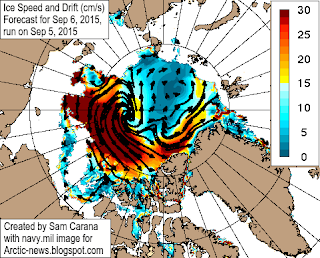 The image on the right, from the Naval Research Laboratory, shows sea ice speed and drift as forecast on September 5, 2015, for September 6, 2015. The situation looks set to get worse. Warm oceans increase the chance that strong winds will emerge that can have a devastating impact on the remaining sea ice in the Arctic. As the September 7, 2015, image below right shows, cyclones are lining up in the Pacific Ocean, with their strongest impact yet to hit the Arctic Ocean. There still is some time to go before sea ice can be expected to reach its minimum, at around half September 2015, while sea currents will continue to carry warmer water into the Arctic Ocean for months to come. 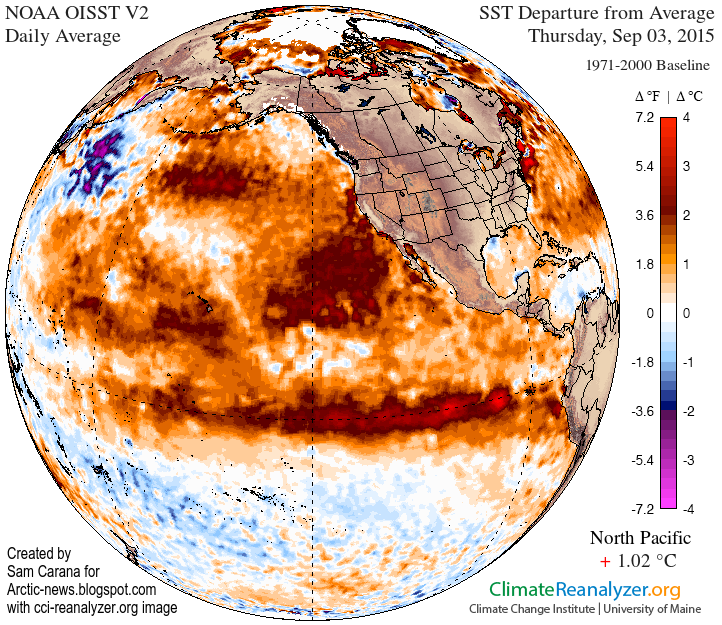 There is a strengthening El Niño, while more open water increases the chance that storms will develop that will push the last remnants of the sea ice out of the Arctic Ocean, as discussed in earlier posts such as this one. Storms can also mix warm surface waters all the way down to the seafloor, as discussed in this earlier post. Cyclones increase this danger. 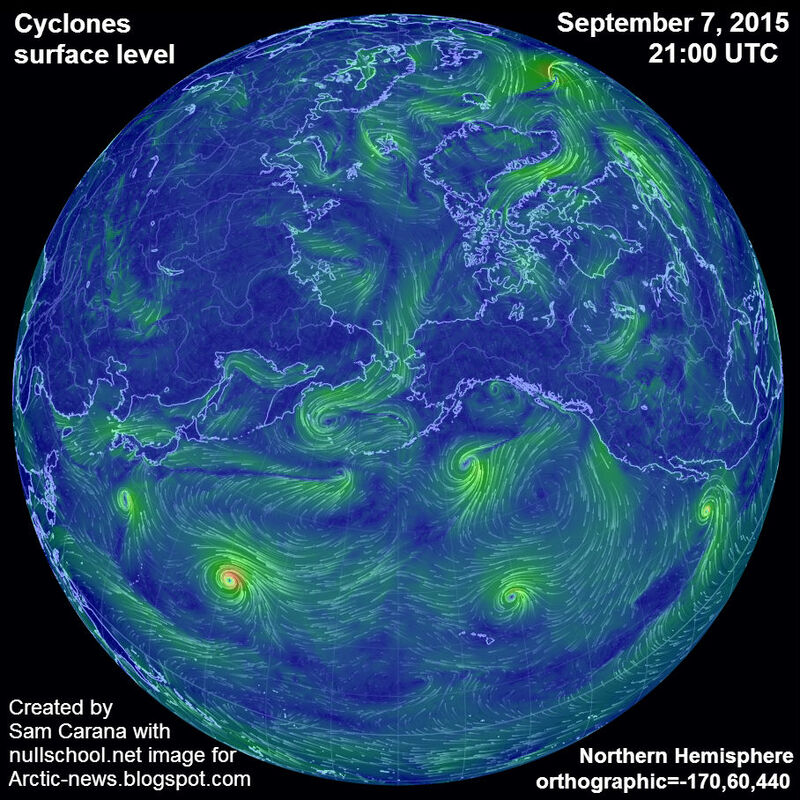 These cyclones are headed in the direction of the Arctic. The Climate Reanalyzer forecast for September 14, 2015, below shows strong winds over the Pacific Ocean close to the Arctic Ocean, as well as over the Arctic Ocean and the North Atlantic. 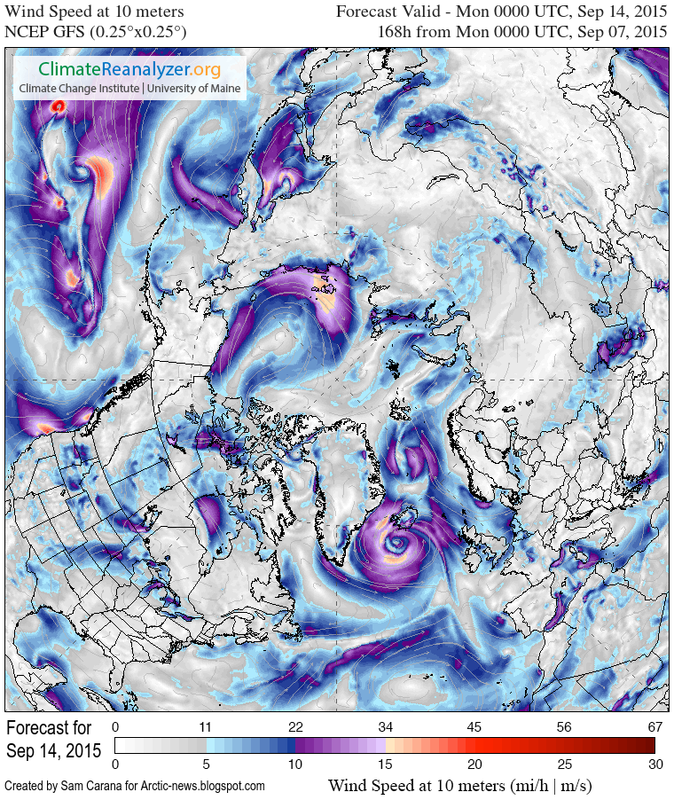 As usual, an excellent post with an alarming update on the arctic sea ice situation. I am very curious about what the first chart seems to indicate has happened in the first week of September: how can about 1 million km2 of sea ice have melted away in the space of just a few days? Is there any explanation for this never seen before event? It seems very strange since for most years, the data from EuroGOOS matches the data from the NSIDC, but this event that seems to have taken place in September 2015 does not appear anywhere in the NSIDC charts. If this is no glitch, then what I think has happened (and what I've been warning about) is that this dramatic fall in extent has not so much been caused by heavy melting, but more by strong winds that have pushed the very thin sea ice closer together, filling up some of the many gaps and holes in the sea ice. We'll wait and see what happens over the next few days to get more clarity. What is amazing me these days, is that this was happening with the economy (something predicted to 2080 happening now) it would be the end of the world's stock exchange markets. This sort of blindness just shows that the Homo Calidus presented by Guy McPherson is not going to prevent its own demise. If a company was having this sort of losses that the world is having right now it would be bankrupt a long time ago. Just this weekend the LA Times had an investigative report saying that over 7 million people fled California in the last 6 years. How isn't this climate refugees? Because its an internal movement inside a rich country, mostly from California to Texas? Even more oddball are the millions of people fleeing to Europe from the MENA region. In a properly informed world they would go South, not North. In 20 years they will need to go back to the MENA region or even further southward! I really don't understand, especially since you just explained the consensual scientific view that if we stop polluting the atmosphere temperatures will go almost instantly up by 2-3 degrees. And that means no sea ice in the Arctic, no permafrost, and lots and lots of methane. I did have a comment here but it was errased! Don't remember erasing your comment, Sheila, but feel welcome to post it again. I sincerely appreciate the dedication and effort you all put into keeping this site current with Arctic news. Love the graphics (as much as one can, they convey huge changes). I did want to mention that most of the information posted is beyond the average American. They do not understand the significance of what it means to have no sea ice. They do not realize the looming threat of gigantic methane release or melting permafrost.There is a gigantic disconnect between events unfolding thousands of miles away and their daily lives. The predictions / expectations of these events have been published as we all know. But it still remains unreal, disconnected and something that can be ignored by most people. It is my opinion that scientists need to do a better job on how this is going to affect the world's populations and not only how fast it will occur, but to point out what has already occurred and how many are already affected. That "news" is not coming from scientist so far, it's coming from bloggers and journalists who are lacking qualifications and credentials. Scientists need to explain clearly how this is all going to affect daily lives and even our ability to survive on this planet near-term. In other words, the warnings are simply not 'good enough' right now. They do not carry the credibility, convincing average persons of how dangerous things truly are. People like myself are seen as scaremongering when we try to explain what this all means. We lack the credentials as non-scientists. We are even seen as opportunists. While some definitely do exist, I've publicly come out against such people. Of late (finally), there have been increasing warnings from the scientific community, but it's still rather weak and disjointed among them. I have long argued that it is the scientists who are best qualified to raise the alarms. The language which they use MUST be clear, concise and convey the extreme urgency of the situation. Public support for climate mitigation and adaption efforts is not only necessary, but absolutely essential - and so far, there are still far too many who remain unconvinced and the remainder remain unchanged in lifestyle. The essential public perception, pressure and demands on government, industry and even the very fabric of our culture must be increased dramatically or all is lost. You know it, I know it and others know it, but it needs to be conveyed, convincing and engaging. Actions must take place of mere words and rhetoric now. Our scientists are scared of the repercussions. Professor Peter Wadhams from Cambridge suggests that some climate scientists have been assassinated. And when seriously good scientists cross the line and become activists as James Hansen has done, they diminish in the publics eyes as scientists. The missing link is a truly free and science literate press reporting in language people understand. To set out the connections and describe the risks. The media is owned by fossil fuel interests. I live in the country with the highest level of climate change denial in the world and one of the most resistent leaders. Your own president is giving mixed messages. I have't found a single person in my community who is prepared to talk about whats going on. That includes our local Greens party representatives. No one wants to know. Even with the staggering refugee crisis in Europe the connections to our future are not made. I have friends who deny the loss of sea ice in the Arctic but talk fluently about Putins massive military investment in the region and expansion if territory to claim oil and gas rights. We should all have a climate literacy way beyond current levels and science daily should replace the sports sections in the back of the tabloids. Our Prime Minister Tony Abbott is in free fall in popularity and I hope to see a climate change literate government as its replacement. i see no possible reasonable way that there could be that big a drop in extent. It would be totally unprecedented, and til now extant has decreased in amounts quite consistant with recent years. More linear thinking. Please look up the word "exponential". The significant drop from one day to the next in the Arctic sea ice extent is clearly not induced by any change in the actual sea ice cover. Apparently one sector (north of Greenland) of the total satellite data covering the Arctic Ocean are lacking and accordingly the sea ice extent is significantly reduced. This happens occasionally and is then corrected the next day, however that is persistent over longer time period is not usual. We are looking in to eliminate the problem and meanwhile the Arctic-ROOS web site is closed. We apology for this error and the debate this has caused! Thanks for commenting, Lasse, an editorial note has been added above the image to clarify things. I check this blog on an almost daily basis and am impressed by it. There is however a little thing I am missing. In the graph depicting the sea ice extent I see an average of 1979 to 2006 including standard deviation. I'd really like a similar average depicting 2007 to X-current. Added to (or even replacing) those years. With the current line. Would that be hard to generate? Would it make the graph less or more indicative & readable? Anyhow, nae bother if it's too much work or you decide against it for other reasons. Your work is much appreciated so thanks anyway.